The third grade students at Orchard Villa Elementary during their poetry lesson with poet Laurel Nakanishi. 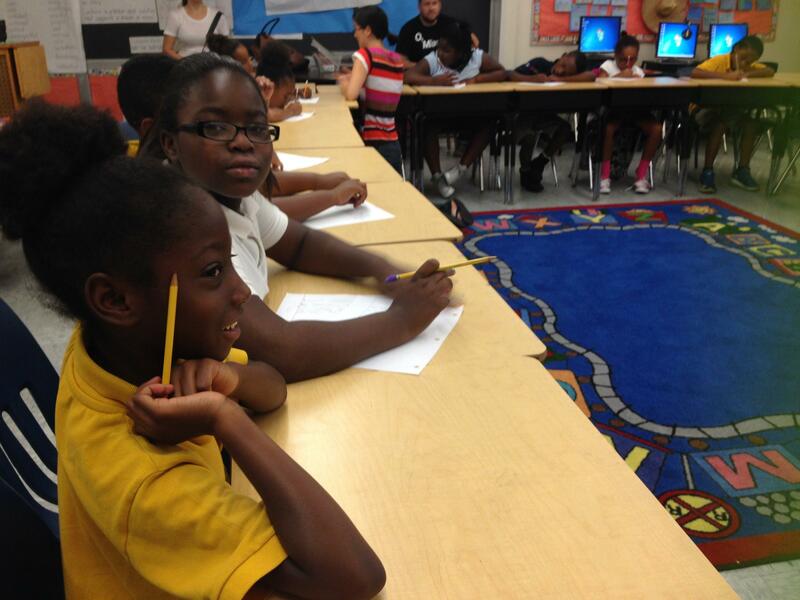 Elementary students in Liberty City are getting lessons from a professional poet through the O, Miami poetry festival. For four weeks students at Orchard Villa Elementary are getting a crash course in poetry from an actual poet. “This is my first time knowing about poetry, and it is fun. And I get to write my own poetry stories and we could talk about our family,” said Kindra Oriental, a third grader. Oriental is one of the students in the third grade class learning from poet Laurel Nakanishi. Nakanishi received her MFA in poetry from the University of Montana and is currently studying at FIU. Isaiah Bell is another one of Nakanishi’s students. “When Miss Nakanishi came here I’m like, ‘Yes! We need poetry!’ Because sometimes in life you have to write yourself a poetry or someone else that needs help cheering up,” Bell said. Scott Cunningham is the director of the festival. He believes that one of the best ways to accomplish his goal is to expose children to poetry as early as possible. The students are going to showcase their work to their parents and faculty next week. The goal of the O, Miami poetry festival is to have everyone in Miami experience a poem throughout the month of April. O, Miami plans to continue teaching poetry in schools. The 2015 festival will go on until the end of the month. Davy Rothbart is a writer, contributor to This American Life and filmmaker. But he is probably best known as founder and collector of lost things for FOUND Magazine, a publication made of "anything that people have found." First Lady Michelle Obama visited Liberty City's Gwen Cherry Park this week to celebrate the fourth anniversary of her "Let's Move!" campaign. The initiative's aim is to fight childhood obesity in the United States through nutrition education as well as creating programs to supply kids with healthier snacks. Michelle Obama made an announcement earlier this week about limiting junk-food marketing in schools and creating healthier options for kids during school hours. This week, she made an announcement that will provide these same choices after school.